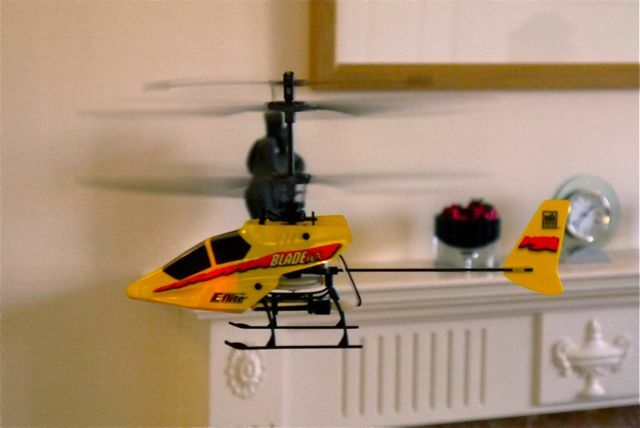 The e-Flite Blade mCX series of helicopters are ideal for those wanting to take the first steps into the world of model helicopter flying. It has now been largely replaced by the newer Blade mCX2, which has a more enclosed canopy to aid airflow and improve stability. It is very stable, due to the contra rotating coaxial ‘fixed pitch’ blade design, with a reliable 2.4GHz DSM radio system to link you with the model. There are lots of models much cheaper than this on the market but many will use a short range infra red link (like you TV remote) and will only have limited flight controls (maybe only 2 or 3 channels). 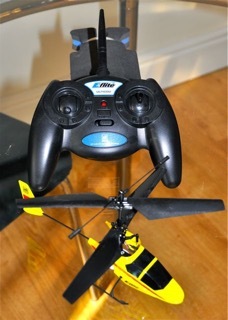 As can be seen by the photos the mCX is a very small model, ideal for flying in a small indoor space. The included transmitter, in the RTF (ready to fly) version, is easy to hold and simple to use. It will get you into the correct thinking and finger wiggling if you decide to move on to bigger things! 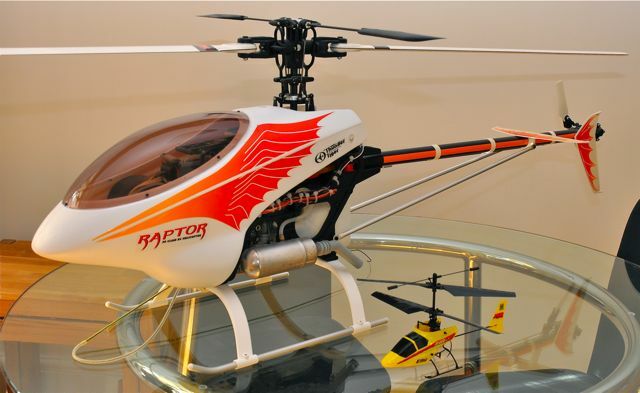 Its compact dimensions are clearly demonstrated when you look at it compared to a Raptor 30 which is a typical beginners outdoor helicopter. I would suggest buying a spare battery, as they are quite cheap, so one can be charging while continuing to fly with the other. When you want to extend your challenge you can buy a Blade mSR BnF (bind and fly) model and use your existing transmitter to save costs. This is the same size as the mCX but now only has a single rotor so is not stable so more cyclic stick (the one on the right that moves the model right/left and forwards/backwards) finger action will be needed to keep the model from dancing about all over the place! Make sure the flight battery is disconnected from helicopter and the transmitter is turned off. Plug the flight battery into the helicopter. After 5 seconds the LED on the 5-in1 unit (control electronics) in the helicopter will begin flashing. PUSH directly down on the left-hand stick of the transmitter while switching the transmitter on (you will feel a ‘click’ when you push in on the end of the stick). If you entered bind mode correctly, you will hear a series of beeps from the transmitter and see the LED on the transmitter blink. You will see a solid LED approximately 5-10 seconds later on the receiver/5-in-1. You should now be bound to the transmitter, and have full control and function.